Zweibrücken, Germany (22 July 2015) – Pallmann Maschinenfabrik GmbH and Co. KG, which is based in Zweibrücken, has extended its range of robust PANTHER recycling granulators, by adding a granulator that has been specially designed for recycling reusable materials from PET bottles. From lemonade to coke, beer and mineral water – more and more drinks are sold in PET bottles. 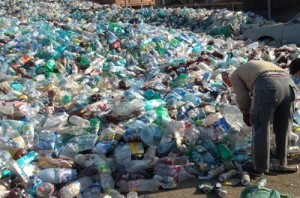 Every year, about 460 billion PET bottles are currently produced worldwide. In Europe alone, an unbelievable 65 billion or more PET bottles were recycled in 2013, so that the resulting raw materials could be used to make more bottles or reprocessed. 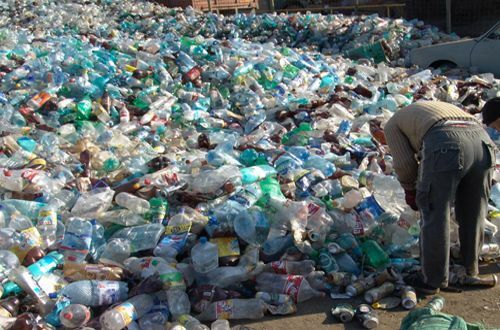 In order to reuse waste PET bottles, they have to be recycled or shredded. With this purpose in mind, the Pallmann “PANTHER” UltraGranulator® is the best possible choice. Individual PET bottles are continuously fed into the cutting chamber, by means of a conveyor belt. Massive, angled rotor knives work with a very close cutting gap against opposing slanted counter knives and cut the bottles into flakes. The special rotor really does cut diagonally and this keeps energy consumption to a minimum. The lower part of the housing is fitted with a large screen, which holds the PET flakes in the cutting chamber until they are discharged through the screen holes. The mesh size can be selected, which determines the size of the flakes and throughput rate of the granulator. Throughput rates of up to 3.5 t/h are possible with a flake size of approximately 14 mm and the appropriate machine size. After being cut, the material is pneumatically suctioned and transported into a cleaning system, in which the PET flakes are separated from the PE, which is still contained in the bottle caps. The resulting secondary raw materials can be recycled in many different ways. They are often reused to manufacture PET bottles. Alternatively, they can be used to manufacture carpets and textiles. The Pallmann “PANTHER” UltraGranulator® is a heavy duty, compact machine, which is designed to meet the special requirements of modern recycling operations. For example, easy access to the cutting chamber makes it easier to clean and wearing parts can be replaced quickly. The rotor and stator knives can be re-sharpened many times and adjusted from the outside. The screens are even reversible, so that both sides can be used. In order to protect the machine operator, the PANTHER meets the latest safety guidelines for machinery. The Pallmann “PANTHER” UltraGranulator® is ideal for continuous operation under tough conditions, seven days a week. The granulator can be integrated into existing recycling lines or used as a stand-alone machine without any problems. If required, Pallmann can also provide a sorting system, which can be used to separate the various secondary raw materials.